U.S. President Donald Trump struck a hard line against North Korea's nuclear weapons program Monday and urged Japan to do the same as he closed out two days of talks, dinner and golf diplomacy in Japan. Trump refused to rule out eventual military action against North Korea and exhorted dictator Kim Jong-un to stop weapons testing, calling the recent launches of missiles over Japanese territory "a threat to the civilized world and international peace and stability." "We will not stand for that," Trump said at a news conference with Japanese Prime Minister Shinzo Abe. "The era of strategic patience is over. Some people say my rhetoric is very strong but look what has happened with very weak rhetoric in the last 25 years." Trump did not deny reports he was frustrated that Japan did not shoot down a ballistic missile North Korea recently fired over its territory. He instead declared that Abe "will shoot 'em out of the sky when he completes the purchase of lots of additional military equipment from the United States." Japan's constitution was revised after World War II to include a clause renouncing war and the country spends only about 1 per cent of its GDP on defence. Abe has slowly tried to remove some of the pacifist constraints and is already seeking money to purchase upgraded SM3 interceptors with greater accuracy and range, as well as other advanced missile defence systems. Under its constitution, Japan can shoot down a missile only when it is aimed at the country or if debris is falling on its territory. But some hawkish members of Abe's Liberal Democratic Party say that it may be possible to shoot down a missile headed toward Guam if it causes an existential threat to the U.S. as Japan's ally. Experts say that is questionable. As part of his Asia tour, Trump will visit South Korea, where he will forgo the customary trip to the demilitarized zone separating north and south, a demonstration of solidarity with the South. Instead, Trump plans to visit Camp Humphreys, a military base about 65 kilometres south of Seoul. U.S. and South Korean officials have said the base visit is meant to underscore the countries' ties, and South Korea's commitment to contributing to its own defence. Burden-sharing is a theme Trump has stressed ever since his presidential campaign. Trump and South Korea's liberal President Moon Jae-in agree on the need to pressure North Korea with sanctions and other deterrence measures. But Trump has warned of unleashing "fire and fury," threatened to "totally destroy" the North, if necessary, and repeatedly insisted that all options are on the table. 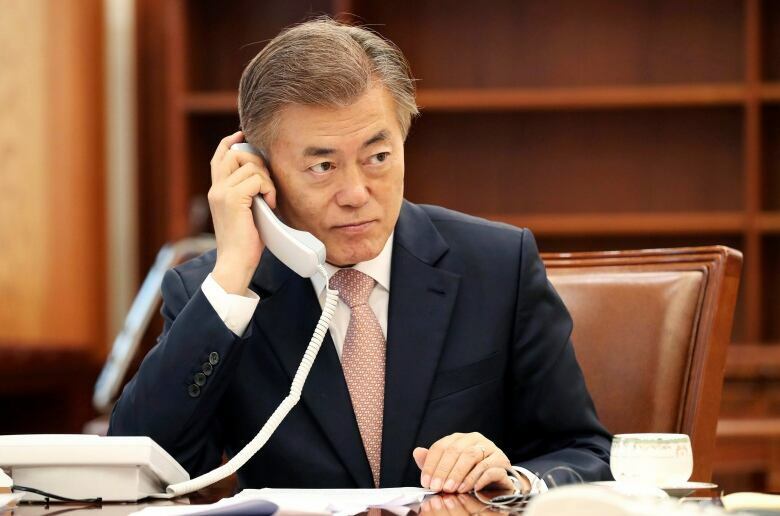 Moon, meanwhile, favours dialogue as the best strategy for defusing the nuclear tension and vehemently opposes a potential military clash that could cause enormous casualties in South Korea. Trump backed up his strong words about North Korea by sending a budget request to Capitol Hill on Monday for $4 billion US to support "additional efforts to detect, defeat, and defend against any North Korean use of ballistic missiles against the United States, its deployed forces, allies, or partners." And as he departed for South Korea, he tweeted that Moon is "a fine gentleman," adding, "We will figure it all out!" On a personal level, Trump and Moon have not developed the same close rapport as Trump has with Abe or even China's Xi Jinping. Part of Moon's mission during the visit will likely be to strengthen his personal ties with Trump, said Michael O'Hanlon, a senior fellow in foreign policy at the Brookings Institution. "Now poor President Moon is playing catch-up ball because everyone acknowledges that he's not bonding quite as much with Donald Trump as the rest of the region," said O'Hanlon. He said Moon could face pressure "to deliver a stronger relationship" whereas "in most other parts of the world, people are trying to keep their distance from Donald Trump." Trade also is expected to be a major topic of discussion: Trump has considered pulling out of the United States-Korea Free Trade Agreement, blaming it for the U.S.-South Korea trade deficit. 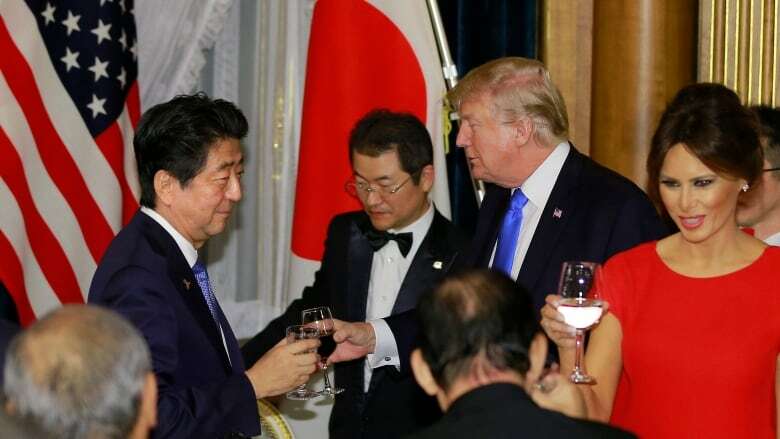 Trump and Japan's Abe have forged strong bonds through meetings, phone calls and on the golf course — a friendship that was on display at a Monday banquet that was the final event of Trump's stop in Japan. In a toast, Trump told about how he was bombarded by phone calls from world leaders after he was elected president. Trump said he returned just a few — including one from Abe, who said he wanted to meet with Trump as soon as possible. Trump responded: anytime. Trump, as he told it, wasn't aware of the protocol against president-elects meeting with world leaders. Trump added that by the time he called Abe to wave him off, Abe was already en route to New York. "So I saw him and it worked out just fine," Trump recalled. 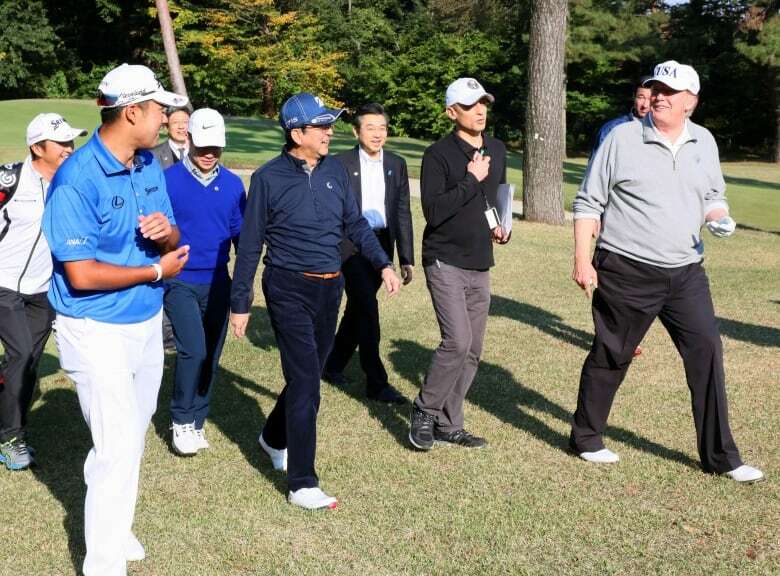 Abe called Trump his "dear friend" and praised the benefits of what he called "golf diplomacy."